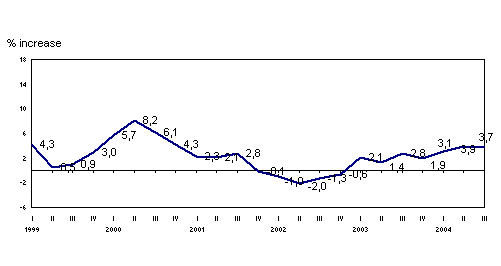 The accumulated figure for the first nine months of 2004 registered 4.8% growth in relation to the same period the year before. 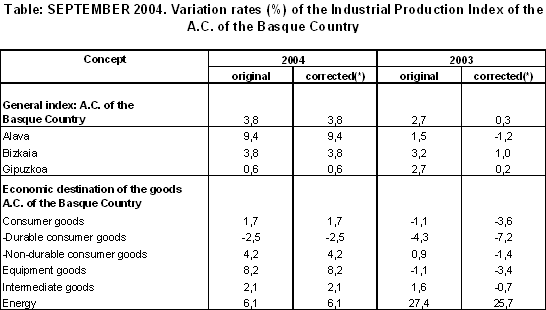 Industrial production in the A.C. of the Basque Country increased by an inter-annual rate of 3.8% in September 2004, according to EUSTAT data. In homogeneous terms, corrected for calendar effects, the inter-annual variation was also 3.8%. Accumulated growth for the first nine months of the year came to 4.8% in absolute terms and 3.6% in homogeneous terms. In September 2004 the most positive inter-annual variations, in absolute terms, corresponded to "Transport material" (17.6%), "Electric energy, gas and water” (14.0%), "Leather and footwear industry" (9.9%), "Paper, publishing and graphic arts" (8.5%) and "Machinery" (7.0%) and, on the other hand, the sectors with negative inter-annual variations were "Textiles and clothing" (-26.5%), "Non-metal industry" (-17.9%), "Oil refining" (-11.3%) and "Metal and non-metal minerals" (-10.9%), among others. Over the whole of the first nine months of the year with regard to the same period in 2003, the highest rates of accumulated growth corresponded to "Electric energy, gas and water" (23.2%), "Oil refining" (12.2%), "Electric material” (10.1%), "Rubber and plastic" (6.4%) and "Transport material" (6.2%). Negative rates only affected the sectors of “Leather and footwear industry" (-14.4%), "Metal and non-metal minerals" (-10.9%), "Non-metal industry" (-10.5%), "Other manufactured" (-6.3%), "Textiles and clothing" (-3.3%) and "Food industry" (-0.5%). According to the classification of goods by economic destination, in September 2004 there was an increase in inter-annual rates for Energy (6.1%), Capital Goods (8.2%), Intermediate Goods (2.1%) and Consumer Goods (1.7%) due to the increase experienced by Non Durable Consumer Goods (4.2%), as Durable Consumer Goods fell (-2.5%). Over the whole of the first nine months of the year, the branch Energy accumulated 20.0% growth in absolute terms, Intermediate Goods registered 3.8%, the same rate as Capital Goods which also rose by 3.8% and Consumer Goods grew by 0.6%, which was distributed between Durable and Non Durable as follows -1.4% and 1.6%, respectively. By province, the inter-annual evolution of the General Index followed different trends, growing in absolute terms, by 9.4% in Alava, 3.8% in Bizkaia and 0.6% in Gipuzkoa. In the whole of the first nine months of the year 2004 the highest accumulated growth corresponded to Alava with 8.5%, followed by Bizkaia with 4.6% and finally, Gipuzkoa with a 3.0% increase.